If you want to project (or “cast”) your computer screen to a TV, second monitor, or projector, an HDMI (or alternative) cable has been the go-to choice for the past decade. But times are changing. HDMI technology was designed in 2002. It quickly grew in popularity, with five million compliant devices sold in 2004, 17.4 million in 2005, and 63 million in 2006. There are now more than 3.5 billion HDMI devices in the world. But now we have Miracast technology, which blows HDMI away in usability and convenience—at least on paper. But is it enough to dethrone HDMI’s reign? The Wi-Fi Alliance launched Miracast technology in 2012. It has since been dubbed as “HDMI over Wi-Fi”—which isn’t technically true, but it gets the idea across. At its core, it removes the need for ugly and cumbersome HDMI cables by letting compatible devices find each other, connect to each other, and mirror their respective screens wirelessly. It’s become an industry-wide standard that Microsoft, Google, Roku, Amazon, and a host of other tech media giants have all adopted. In the last couple of years, Google Chromecast has become a must-have smart TV accessory. What you probably didn’t know is your smart TV has a Chromecast alternative: Miracast. or Apple’s AirPlay. In fact, many observers consider Miracast a direct response to the Apple’s proprietary system. The technology uses Wi-Fi Direct, a protocol standard that enables two devices to form a direct, peer-to-peer Wi-Fi connection. This connection allows them to connect to each other without the need for a wireless router as a middleman. When setting up wireless encryption on your router, you’ll come across a variety of confusing terms — WPA2, WPA, WEP, WPA-Personal, and WPA-Enterprise. Media-wise, Miracast makes use of the H.264 codec, can display 1080p video resolution, and produces 5.1 surround sound audio. It also benefits from a DRM layer, meaning any Miracast device can mirror copyright-protected content—like DVDs and music—without any hassle. Why Should I Use Miracast? The most significant benefit to Miracast is its widespread adoption across many different types of devices. Even though most people have never heard of Miracast, the good news is that it’s actually quite common. As long ago as October 2012, Google announced that Android version 4.2 and newer would support the Miracast protocol. 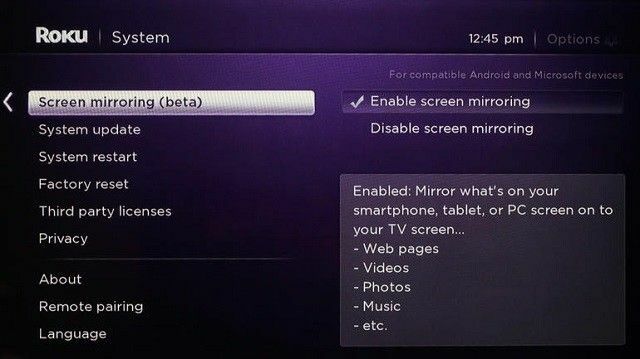 Windows added Miracast functionality with the release of Windows 8.1 in 2013, and Blackberry, Roku, Amazon Fire, and the newest Linux distros quickly followed suit. The notable exception is Apple. Most new smart TVs also have Miracast built in. Even if yours doesn’t, don’t worry—you can easily buy a Microsoft Miracast Receiver on Amazon. If that price is too expensive, you can search for third-party alternatives that sell for as little as $20. To check whether your device is Miracast-compatible, you can check the Wi-Fi Alliance’s website. It keeps an updated list of all Miracast-enabled devices, with the total number now pushing towards 10,000. It’s important to know that not all Miracast devices carry the Miracast brand name. For example, if you’ve ever used LG’s SmartShare, Samsung’s AllShare Cast, Sony’s Screen Mirroring, or Panasonic’s Display Mirroring, then you’ve used Miracast. No Wi-Fi needed: You can stream to another device even if you’re miles away from a router (e.g. when you’re traveling or working in the field). No cables: No more rooting around behind a dusty TV trying to find ports. Ease of use: The two devices will automatically find each other with hardly any user input. Imagine being able to walk into a hotel and cast Netflix from your tablet onto your room’s TV immediately. Can Miracast Really Replace HDMI? What makes HDMI vulnerable to usurping? As it turns out, HDMI has a handful of disadvantages that make it pretty inconvenient at times. Distance: Your computer can only be as far away from a TV or second monitor as the HDMI cable allows. This isn’t much of a problem for home users. However, if you’re in the office and want to connect to a screen for a conference or presentation, it’s annoying. Sure, longer cables are available, but they’re harder to keep neat, require more storage space, and cost more. On-screen issues: It’s not uncommon for the HDMI output to be blank, which is a problem caused by authentication errors. The same authentication issues can lead to screen flickering and lag, all of which are frustrating if you’re watching a movie or giving a presentation. Compatibility: Tablets, smartphones, and some smaller laptops do not have HDMI ports. It means that if your content is locally saved on one of those devices, you won’t be able to mirror it on a larger screen. HDMI worked well in the era before we became hyper-mobile, but it’s starting to look dated. Despite the growth and flexibility of Miracast, it would be foolish to pretend that it’s perfect. It too has some limitations and drawbacks. Wondering how to use Apple’s AirPlay mirroring, or need help connecting your Mac to an Apple TV? We’ll teach you the basics of using AirPlay. The aptly named Chromecast 2.0 is Google’s first major revision to the device since it was first released all the way back in July 2013. What’s new? do not support the technology either. In fact, many critics believe that both AirPlay and Chromecast are “smarter” thanks to their ability to multi-task. Whereas Miracast will display what’s on your screen and nothing else, both AirPlay and Chromecast allow users to cast a video in the background while still performing other tasks in the foreground. Secondly, Miracast still significantly trails HDMI in public uptake. Even though 10,000 supported devices sounds like a lot, it’s way behind the 3.5 billion HDMI devices in use. At this stage, you couldn’t feasibly go to a meeting or conference and expect the equipment there to be Miracast compatible. You’d still have to take an HDMI cable with you. Ultimately, HDMI is so ubiquitous that it will take a long time to phase out completely. Lastly, it is important to remember that this is still a new and developing technology and can, therefore, be buggy on occasion. I can speak from experience here. My Windows 10 computer will only pair with my Roku stick about 75 percent of the time—the other 25 percent I find myself reaching for the HDMI cable. On the one hand, Miracast is not ready to displace HDMI right at the moment. The lower number of supported devices, buggy connections, and lack of universal compatibility make it too unreliable for consistent use in the wider world until adoption rates improve. However, can it eventually replace HDMI in the future? Absolutely. The bugs will be ironed out, more devices will come online, and more users will demand a mobile-friendly solution (hopefully forcing the likes of Apple and Google to bite the bullet). Windows 10 has built-in abilities to mirror its screen on your TV. Here’s how to use Windows 10 with Miracast. and how to cast Android to Windows using Miracast.